Kenneth Harvey Antiques is located at the Ground Floor inside the Furniture Cave. Kenneth Harvey first started dealing in antiques in the late 1970’s with his first shop in North Lincolnshire. After moving to London in 1989, he started working for an antiques business in Kensington Church Street, before taking space at The Old Cinema Antique Centre in Chiswick, quickly followed by a move to the world famous The Furniture Cave in Chelsea. 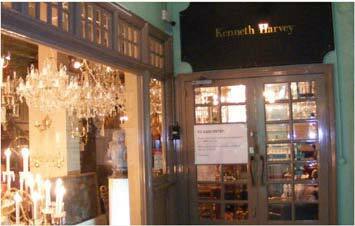 Kenneth Harvey now trades from one of the biggest and most impressive shops in London and has some 4,500 Sq foot showroom space. The variety and quality of his stock is simply amazing, spanning the centuries and styles, collected not only from auctions and estate sales throughout the U.K., but also his regular trips to the Continent and of course a good selection directly from private sources. Having a successful business, Kenneth has built an excellent international client list of private collectors, dealers and decorators, many from The United States, but also in far away countries such as Thailand, Australia and South America. We take pride in our service, giving honest advice, and providing competitively priced shipping quotations to destinations worldwide, either by air or sea, usually door to door, including insurance, so there shouldn’t be any hidden extras. Kenneth is assisted by a number of friendly, professional and helpful staff who include Jason Myer the showroom manager. We hope you find our website interesting and look forward to being of assistance to you.